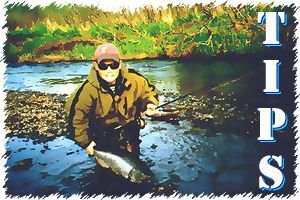 Alaska Flyfishing Online - Fly Fishing Tips For Successful Fishing in Alaska! Readers will find our content unique to say the least. We maintain a genuine desire to pass on decades of "insider" wisdom, experience, and expertise that will result in a more enjoyable and rewarding experience when fly-fishing in Alaska. Our TIPS section will provide you with the "right stuff" you can take with you on your very next outing. REDUCE HOOK FOULING ON LONG FLIES! - Necessity is the mother of invention. And so because of a problem with long flowing bunny leech patterns occasionally wrapping on the hook, this tying trick was born. MAKING A TOUGHER PEACOCK! - It can be frustrating to be using a successful fly containing peacock herl and watch it disintegrate in short order by aggressive, toothy fish. Here is a tip that will provide additional durability to this fragile yet very important fly tying component. LESS IS MORE! - Some streams and rivers in Alaska are "hammered" all season long by droves of anglers making some fish reluctant to bite. Try this tip as a tactic for improved success in tough conditions. TYING WEEDLESS FLESH FLY PATTERNS - If you are a trophy-seeking angler, you know you must fish some real fortresses in the streams to dig out those lunkers. The only effective way is to tie 'em up weedless. MAKING AN EGG-SUCKING ANYTHING - Egg-sucking patterns are the staple of fly casters for fishing nearly every species in Alaska. Here is a way to always be prepared in the field. CALMING FISH FOR HOOK REMOVAL - Controlling Alaska's large salmon and trout to remove the hook can be a significant challenge for fish with a lot of remaining energy. Here is a tactic to try which produces very good results. The OPEN CLINCH KNOT - Fly-fishing is a collection of many skills intended to present imitations to fish in the most realistic manner. "Knot knowledge" may be one of those insightful goodies too often overlooked.